Cortney and I met in high school, but we were not high school sweethearts. We were not even college sweethearts, although he did go to my college for a year before transferring to where his girlfriend went. At some point in college, during the summer between my sophomore and junior year–the last summer I would come home and not stay in my university’s city–I began dating a mutual friend of ours. I dated this friend for five years before he broke my heart. After I graduated from college, but before the horrible breakup, Cortney found himself living with this friend. This is where this part of the story begins. He was already about six Bud Light Bottles into his night when I got to the apartment. Neither of us remember why in the world he was sitting home drinking alone, but there he was. I had used my key to get in. I used my witty sense of humor to laugh at his slurring words. I thought I would be alone watching TV, waiting for my boyfriend to get off his third shift job. He didn’t usually work Friday nights, but sometimes if they had mandatory over-time, he would need to put in a few hours. This was one of those nights. “How many have you had?” I asked Curly. He was already slurring and giggling at nothing. And that is when I started laughing at him. I wasn’t drinking, unless you count the 20-ounce Diet Coke I had with me. “He’s not home,” he told me for no apparent reason. I rolled my eyes, but was happy I wasn’t going to have to stare blankly at a TV waiting for the boyfriend to get back. One of us decided sitting on the deck would be a grand idea. Probably to get him some fresh air. I don’t know if you have ever heard the term “zero to drunk,” but that is what I watched happen to my friend, Curly that night. He went from sober (zero) to D-RUNK in like 20 minutes. At one point while we were chatting outside, he warned me to get to the side of the deck because he was going to attempt to move a chair. I was no where near getting hit with the chair. And he may have almost fallen over the deck edge trying to move said chair…for no apparent reason. This was when I guided him back inside to the safety of the couch. It was also where our conversation turned from the usual Pearl Jam, concerts, TV, movies, friends talk to deeper stuff. If you’ve been following our story, you know Cortney gets very…truth-spilling…when he’s had a bit to drink. And if you have been following this blog, you know he isn’t much of a vocally communicative person otherwise. But this evening, was different. I don’t know if it was just the booze, or if it was also the fact that we didn’t get a lot of chances to hang out just the two of us, but he felt like talking, and I let him. We discussed religion and church and what our parents were like when we were kids. It was then that I realized that compared to all our other friends, he and I had the most in common as far as our background. I also realized that he had the same basic beliefs about Christianity, religion, and church as I did. This was big because at that time, I had found no one who was that similar to me in beliefs. Drunk or not, I was enjoying the chat we were having. And then we started talking about how hard it was for him to find someone in our town to date. He wasn’t a very forward guy. In fact, he was pretty old-fashioned when it came to courting the ladies. Unless you were into meeting people at church or going to the biggish city nearby to the bar scene, our smallish city was not exactly known for happening places for singles to meet. He had been living there for three years and only been out on a handful of unsuccessful dates. He was discouraged. He was heading into his mid-twenties with no one. And that was scary. And that is when he started telling me how jealous he was of my relationship with my boyfriend. It seemed so perfect, he said. We were a “cool” couple. Then he started telling me how lucky my boyfriend was to have such an awesome girl like me. I knew he wasn’t trying to be all seductive; he was just working through his thoughts. I knew what he meant…he wasn’t trying to be rude, he was just being truthful. He thought I had great qualities, obviously, we were friends. But also, we were friends. I was not who he wanted as a partner. You know…until the very next year when he did get a girlfriend exactly like me. You have no idea how similar this story is to my own. My guy and I went from friendship to the idea of something more on a late night online conversation where he was drunk and I was not. We talked about religion and faith and family and love and at the end of it he told me I was the perfect girl. I love stories like this. Glad it all worked out! Your kids will be so lucky to read this one day. And if they’re too weirded out? Their partners and kids will for sure love it! I love this story! I married a not very vocal communicator too. Unless he’s had a few and then he’s a Chatty Cathy. But seriously, I LOVE this story! Oh how I love this! On so many levels, not the least that you WERE friends and as we all know now, friends make the very best partners in life. You were so young! That picture is adorable. I love reading your story… it’s very similar to my first marriage, actually. We were friends all through high school, until my very last year in college when we finally saw each other as more than friends. I also love that you’re telling your story for your boss. It truly will be a treasure for them when they’re grown. *Okay, that’s not exactly our story but it made me laugh. Love this post and the throwback picture too. Yay! I LOOOOOOOVE your story already. What an awesome story. I love hearing stories of how couples met and fell in love. And how cute is that picture? Cutest story every. And that picture? Seriously. <3 how we met stories. 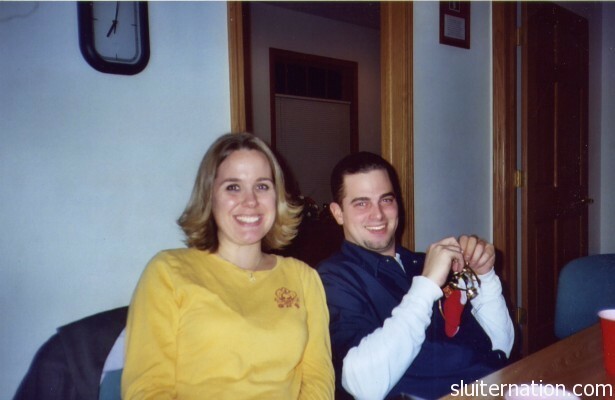 Clearly you were destined to unite and become Sluiter Nation.